Tony Ashton passed away peacefully on Monday, 28th May, 2001 at his home. His wife Sandra and daughter Indira were at his side. This special commemorates Tony Ashton's unique talents, with particular focus on his connections to Deep Purple. Walid Itayim runs an excellent Tony Ashton web site with more details on the man in general. May his memory live with us forever. Tony Ashton first entered Deep Purple history when his band Ashton, Gardener & Dyke supported Deep Purple in the early 1970s. He became friends with Jon Lord and they teamed up for the "First Of The Big Bands" album from 1974. This project was launched with a gig at London's Paladium the same year and the BBC taped a special live appearance at Golders Green Hippodrome in London. The album of this show, titled "First Of The Big Bands, BBC Live In Concert 1974", is a tour-de-force groovy, rhythm & blues, boogie piano and Hammond organ, big band fest. Nothing less! 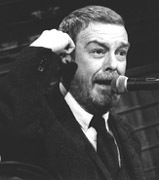 Tony Ashton appeared on several of Jon Lord's solo albums - "Gemini Suite", "Windows" and "Before I Forget". Together they also composed the soundtrack for "The Last Rebel" movie in 1971. Tony also contributed to Roger Glover's "Butterfly Ball" project and Eddie Hardin's "Wizards Convention" album. Please visit the Tony Ashton website for a comprehensive discography of his work. Tony Ashton's most prominent role in the history of Deep Purple came when he got together with Jon Lord and Ian Paice in 1976 for the excellent but short-lived Paice Ashton Lord project. Their only album "Malice In Wonderland" is a classic in its own right, showing off not just Jon Lord and Ian Paice at their very best, but in particular Tony Ashton and his peculiar and unique style of singing. The album is a powerful and diverse showcase of the band's special and elaborate twin-keyboard musical style. Sadly, touring activities were confined to a few shows in the UK and efforts to put together a second album were aborted. A few surviving tracks have finally seen the light of day as bonus tracks on a recent re-issue of "Malice In Wonderland" on Purple Records. This special is best enjoyed with a pint and a loud Tony Ashton CD. He would have loved it that way. Comments and contributions are welcome. Please visit the Tony Ashton guestbook. With special thanks to Walid Itayim.